If you want to keep something safe, build a mountain fortress above the Arctic Circle. That’s the thinking behind the Svalbard Global Seed Vault. Almost every nation keeps collections of native seeds so local crops can be replanted in case of an agricultural disaster. The Global Seed Vault, opened in 2008 on the far-northern Norwegian island of Spitsbergen, is a backup for the backups. It’s badly needed as many as half the seed banks in developing countries are at risk from natural disasters or general instability. The vault can hold up to 4.5 million samples, which will be kept dry at about 0°F (-18°C). Even if the facility loses power, the Arctic climate should keep the seeds viable for thousands of years. 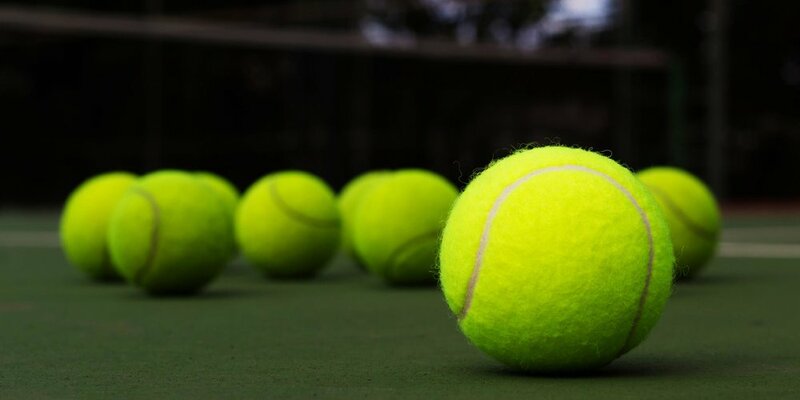 Why Do Tennis Balls Go Flat? A tennis ball is essentially a pressurized rubber ball covered with cloth. The rubber is not completely impermeable, however, and slowly leaks over time, just like a latex balloon eventually loses its air. In a game, when the ball hits the court surface, the outside of the ball caves towards the center to make an indent on the side. That force pushes the air inside in the opposite direction (towards the other side). The outward force of the indent pushes the ball away from the court surface, which means the ball bounces up. More and more air keeps on getting out over time until there is not enough pressure inside a ball to help bounce it back up. 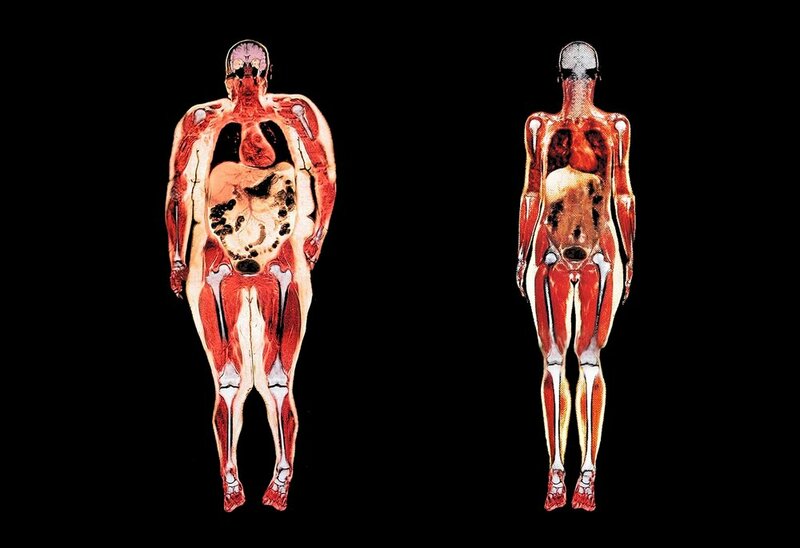 This MRI scan shows the difference between a healthy (120 pound) and obese (250 pound) woman. You can see where the strain is put on an obese body. Excess fat not only encases the woman’s waistline but also wraps around her heart, liver, lungs and tissues. Does Salt Melt on Food? No. Unlike sugar that will melt at 366 °F (186 °C), salt remains in a solid state during the cooking process. Salt's melting point is 1545 °F (841 °C) which is significantly higher than the melting point of an aluminum frying pan. The reason that salt seems to disappear after you sprinkle it in a pan is that when salt comes into contact with water, the H2O will pull apart the sodium chloride on a molecular scale appearing to dissolve it. The salt, however, will remain intact, once the water is removed. 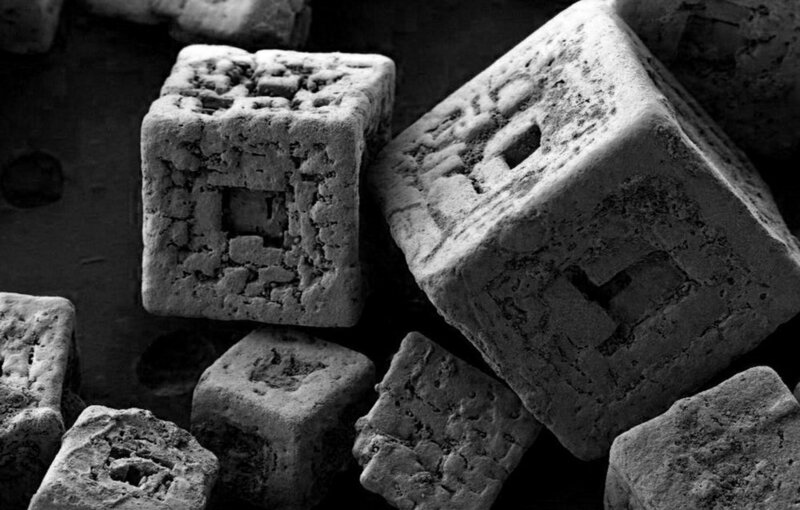 Note: The header image is table salt (sodium chloride) at 150x magnification. If the earth was a perfect cube, what would the gravitational effect be at the edges? Could you casually step over the 90-degree bend onto an adjacent face? The first thing you notice on being teleported to cubical earth is that you’re at the edge of a vast body of water we’ll call the Central Ocean. The land rises steeply away from the shore — apparently, the ocean lies in a basin. This strikes you as odd since you’d think the sides of a cubical planet would be flat. Patience. All will soon become clear. Turning from the ocean and looking out over the land, you discover something else — you can see vast distances. On spherical earth, the horizon on average is a little over three miles away. On cubical earth you can, in theory, see to the edge of the planet, potentially a distance of thousands of kilometers. Up the slope you’re standing on, impossibly far off, you can make out a gigantic mountain peak — one of the corners, you realize, of your cubical world. Time to get hiking. I hope you’re in good shape since the path literally becomes steeper with every step — you’ll have the impression of climbing up the inside of a round bowl. Worse, the mountain is stupefyingly high. How high? Well, the tallest known mountain in the solar system is Olympus Mons on Mars, 22 kilometers high from base to peak. In contrast, the vertical rise from low point to high point on cubical earth is about 3 700 kilometers. So you’ll need to bring a spacesuit — the atmosphere gets progressively thinner until there’s none at all and you’re in the blackness of space. One consolation is that your weight steadily decreases. If you weigh 200 pounds at sea level back on spherical earth, you’ll discover when you finally reach the peak that you weigh just 103. But here you are, on top at last. You don’t have the sense of walking around 90-degree corners that you may naively imagine. Rather, the peak looks like the tip of a three-sided pyramid. The three sides fall away steeply — if you lose your footing you’ll have a wicked drop. On the plus side, the view is like none on earth, or on any planet anywhere. You can sight down one edge of the cube to a far corner, a distance of some 10 000 kilometers away. Even more strikingly, you see all the atmosphere and water has been concentrated by gravity into a blob in the middle of each face, with the corners and edges poking out into space. You realize your cubical planet isn’t one world but six, each face’s segment of the biosphere isolated from the others by the hopeless climb.